Sweet Honey in the Rock is a world-renowned and Grammy award-winning musical ensemble. 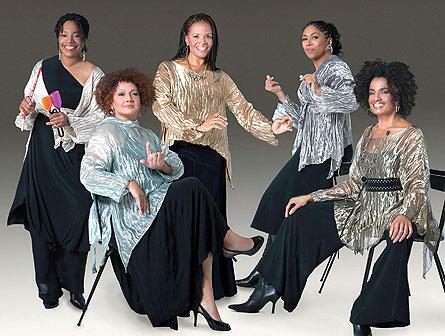 The group is an all-woman, African American a cappella ensemble, rooted in African American history and culture. The ensemble educates, entertains, and empowers its audience and community through the dynamic vehicles of a cappella singing and American Sign Language interpretation for the deaf and hearing impaired. Sweet Honey in the Rock has performed throughout the world, has been the subject of two PBS documentaries, and was invited to perform at the White House. This tour celebrates the group’s 40th anniversary as an ensemble, a history that includes a prior visit to Hope. Sweet Honey in the Rock previously appeared on the Hope College Great Performance Series in 1988. With political and social activism as much a cornerstone of its objective as creating multi-genre music, Sweet Honey in the Rock began performing in 1974 and was soon performing at various festivals in the United States and Canada, including the Smithsonian Festival of American Folklife at the National Mall in Washington, D.C. After the 1976 release of its first album, eponymously titled, the group expanded its touring, which included appearances at the 1979 Musicians United for Safe Energy (MUSE) concerts in New York City that became the “No Nukes” concert film and album. In the summer of 2011, Sweet Honey in the Rock and other MUSE artists performed a benefit concert for disaster relief efforts in Japan. The ensemble embraces a wide range of musical genres, including spirituals, blues, folk, gospel, jazz, popular and world music. Individual tickets for the Oct. 17 performance are $18 for regular admission, $13 for senior citizens, and $6 for children 18 and under. Season tickets are also still available for the 2014-15 Great Performance Series, which will continue with the Brentano String Quartet (Nov. 7), the Rastrelli Cello Quartet (Jan. 23), Broadway’s Next H!T Musical (Feb. 12-13) and The Bad Plus (March 25). Season subscriptions are $70 for regular admission, $55 for senior citizens, and $140 for a family (regardless of the number of children). The subscriptions are such a savings that they are equivalent to seeing two shows for free. Tickets are available at the ticket office in the Events and Conferences Office located downtown in the Anderson-Werkman Financial Center at 100 E. Eighth St. The Events and Conferences Office is open weekdays from 10 a.m. to 5 p.m. and can be called at (616) 395-7890. More information about the season may be obtained online by visiting hope.edu/gps/.